The NEW LEER Latitude soft tri-fold tonneau cover delivers style, functionality, and security, all in one cover. Using the exclusive LEER patented CYNC™ latching system, opening and closing the cover is a snap. The system can be closed with the tailgate either in the open or closed position, can be controlled from either side of the truck bed and requires only 2 fingers to release the latch. 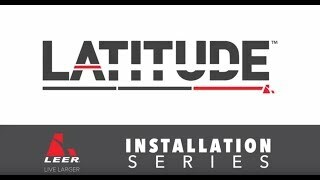 LEER Latitude uses an efficient self tensioning system to keep a rugged yet stylish vinyl cover secure and added security fasteners ensure that the cover provides superior performance in even the most extreme conditions. Beautifully rounded reinforced corners, easy maintenance and LEER's Limited Lifetime Warranty make Latitude your best flexible folding cover choice. Sturdy yet flexible and rugged vinyl cover material is designed to give years of service. This is a great cover! Fit my F-150 5.5' bed without an issue. Took me maybe 10 min to install it. The design of the opening mechanism is great, allowing you to do it with one hand from one side of the truck, by yourself. Seals well, and easy to close without having to have the lift gate open in order to to close it like most. Awesome!